Normally, when we go shopping in the States, we hit the Seattle Premium Outlets while bypassing Bellingham. Yes, there once was a time where Bellingham was the place to shop. That would probably explain the construction of Bellis Fair. Even then, we never roamed the streets of Bellingham looking for eats. I think my parents exclusively brought me to Royal Fork buffet. Yah, it didn't exactly set the culinary scene on fire. You see, there were (and still are) no real buffets in the GVRD. Now we have Old County Buffet and that satisfies the "quantity-over-quality" urges every now and then. Today, we dare to venture into areas of Bellingham we'd never been before. Better yet, we were on the lookout for a taco truck. 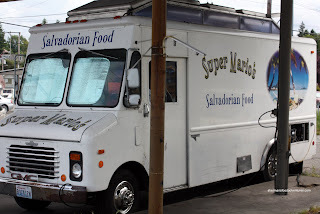 With the lack of good street food in Vancouver (although there are recent developments aiming to change that), we had to head to Bellingham of all places. 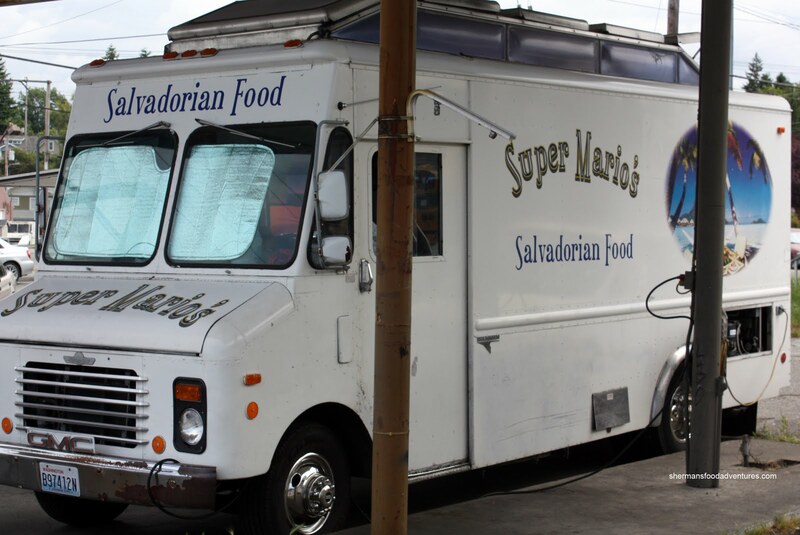 Located on N. Forest, Super Mario's serves up Salvadorian and Mexican food from a catering truck. 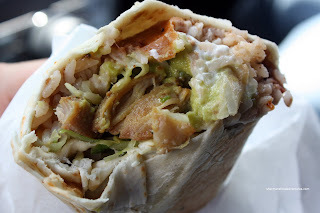 Apparently, one of their signature items is the Wonder Burrito which comes in chicken, beef, pork or tongue. I got the chicken since Viv doesn't like tongue (beef tongue that is...). Filled with rice, beans, lettuce, guacamole and chicken, the burrito must've weighed a pound. Nothing particularly amazing about the burrito other than it was a good value. I also got 4 Tacos with one each of all the meats including beef steak, chicken, pork and tongue. 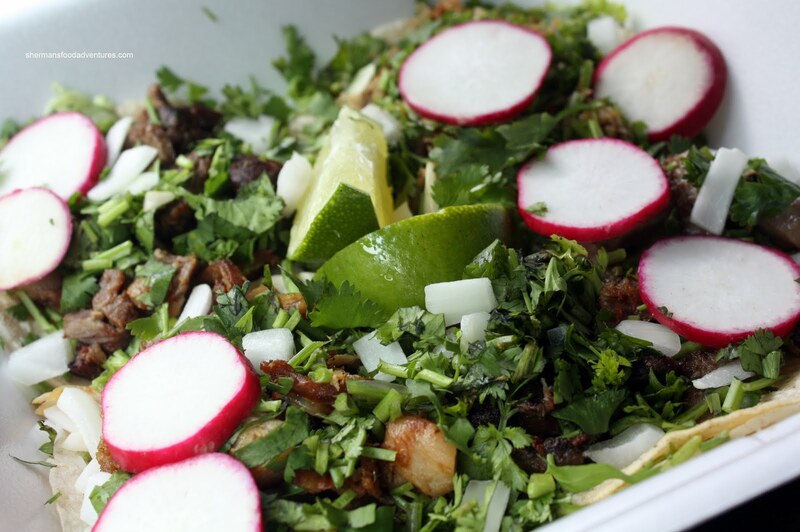 As you can see in the picture, there is a massive amount of cilantro on top with onions, radishes and lime. Other than the tongue, the other 3 meats were very dry and in the case of the beef, over-seasoned. The pork was actually quite stringy. On the flip-side, the tongue was quite tender. I would definitely say the ones I've had at La Taqueria in Downtown Vancouver to be better in overall execution. 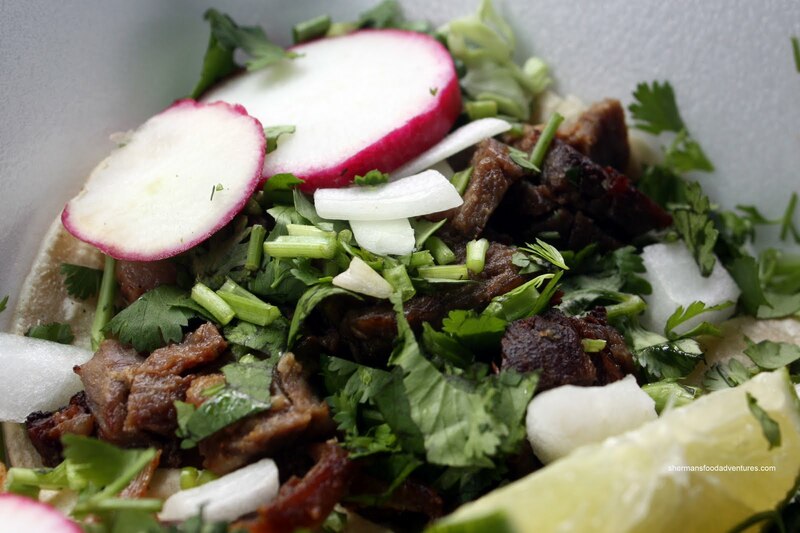 Whatever the case, the novelty of a taco truck in the most unlikeliest of locations made it a must-visit. Sure, the food didn't blow me away; but the burrito was an excellent value. There is much more on the menu that I did not get to try and for that, I'd do a return visit based on that. Now, the question: how much $$$? Talking about eating in the Bellingham area, I recently tried Coconut Kenny's on James St. and they had awesome pizza and a pretty good pulled pork sandwich. Their spicy chicken wings were pretty good too. They make their breads with a hawaiian flavour, ie. the dough is sweeter than regular bread dough. Anyways, next time you're in the area, it's just past Trader Joes. The prices are under $10 each. As for food trucks, I love the taco truck in Burlington just past Cascade Mall. Sorry, can't remember the name but tacos rival the ones in town. Looks like a fun day trip! For those who stay in town, thankfully there the street vendors are slowly opening. I was at Panda Fresh Bakery in Yaletown yesterday and will be headed to Re-Up BBQ on Georgia later this week. Have faith, fellow lovers of food! Kim, I think the food was good; but the meats in the taco were way too dry. Sure it's street food, but it has to be chewable too. It's cheap, the 4 tacos were like $5. Thanks for the tips Holly, gonna check it out next time! I was at Cascade Mall too! Thanks James, so many new street vendors in Vancouver. Too many to try! apparently they have a restaurant location as well. I haven't tried it yet but I will next time I am down there. @Sedap Yah, I noticed that as well. I didn't realize they were affiliated. Thanks though.